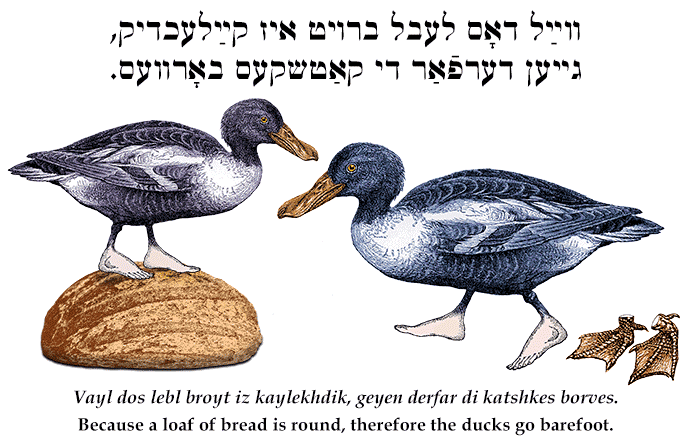 Yiddish Wit: Because a loaf of bread is round, therefore the ducks go barefoot. ווײַל דאָס לעבל ברויט איז קײַלעכדיק, גייען דערפֿאַר די קאַטשקעס באָרוועס. Vayl dos lebl broyt iz kaylekhdik, geyen derfar di katshkes borves. Because a loaf of bread is round, therefore the ducks go barefoot. A mocking response to a non sequitur. SOURCE: Stutchkoff, Der Oytser fun der Yidisher Shprakh.